Eliminate the hassle of dripping with EZ Dripper! Simply put the RBA up to the tip of the EZ Dripper, push up, and the EZ Dripper will let out a small amount of your favorite E-Liquid, saturating the wick. Each push on the EZ Dripper is equivalent to about 5 drops of E-Liquid. One push not enough, give it another push. Instead of pushing on the tip, hold the RBA there and the EZ Dripper will let out a small stream of E-Liquid. 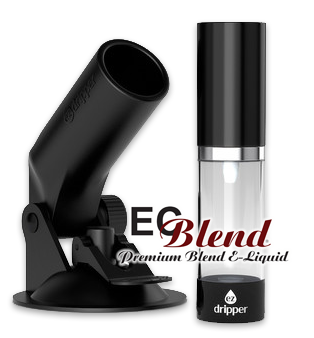 The EZ Dripper was designed with simplicity in mind and being hassle free. Consisting of 2 separate pieces, a bottle and a mounting bracket. The mounting bracket is capable of being mounted on any smooth flat surface using the heavy-duty suction cup. The bottle has a 15mL capacity as well as a very large hole for easy refilling. Drip responsibly, don't drip and drive. Click the button below to add the Rebuildable Accessory - EZCloud - EZ Dripper - 15mL Capacity to your wish list.